There's something for everyone in this unique gourmet El Rio crate. 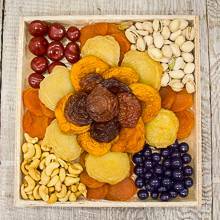 Our most popular dried fruits come together in a delicious and special gift crate. Make this a gift to a special someone, they will be sure to love it. Packaged in a wooden crate. Net wt. 2 lbs. Ship wt. 3 lbs.